What Are Truck “No Zones”? Home/Truck Accidents/What Are Truck “No Zones”? No-zones are blind spots. Cars, motorcycles, trucks, and pedestrians positioned in these spots can’t be seen by the truck driver – even with rear and side-view mirrors. If the truck driver doesn’t see you and doesn’t have a reason to anticipate you, then the driver is much more likely to collide with or even crush your vehicle or an individual. The large dimensions of the truck and the design of most commercial trucks makes it much harder to see traffic behind and to the sides. Trucks are much longer higher, and wider than other vehicles. They are also much heavier. When a truck strikes a car, the occupants of the car are much more likely to die or suffer than the truck driver is. The rear of the truck. Most trucks, unlike cars, do not have a rear-view mirror. The sides of the truck. 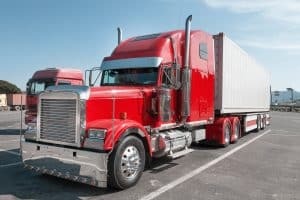 The length and width of semis, rigs, and tractor-trailers, makes it hard for the truck driver to see passenger cars that drive alongside the truck. This is especially true for cars that ride along the trucks’ right side. The front of the truck. Due to the height of most trucks and tractors, truck drivers often can’t see a car that is right in front of them. Generally, a car that 20 feet or less ahead of the truck might not be seen by the truck driver. Wide turns. When trucks turn they usually need to swing quite wide in order to make the turn. The driver, during a turn, often can’t see cars directly to their side or behind them. Many trucks now even have signs that say something like, “Danger – Trucks Make Wide Turns.” If your car is too close to a truck, even if it’s just waiting at a stop light or red light, there’s a good chance it will get crushed when the truck turns. At the Rocky McElhaney Law Firm, our Nashville truck crash lawyers hold truck drivers and shipping companies liable if their driver was negligent or careless and that negligence caused your injuries or the death of someone you love. To speak to a strong advocate, please call us at 615-246-5549 or use our contact form to make an appointment. We handle truck accident cases for clients in Nashville, Hendersonville, Knoxville, and throughout the state.